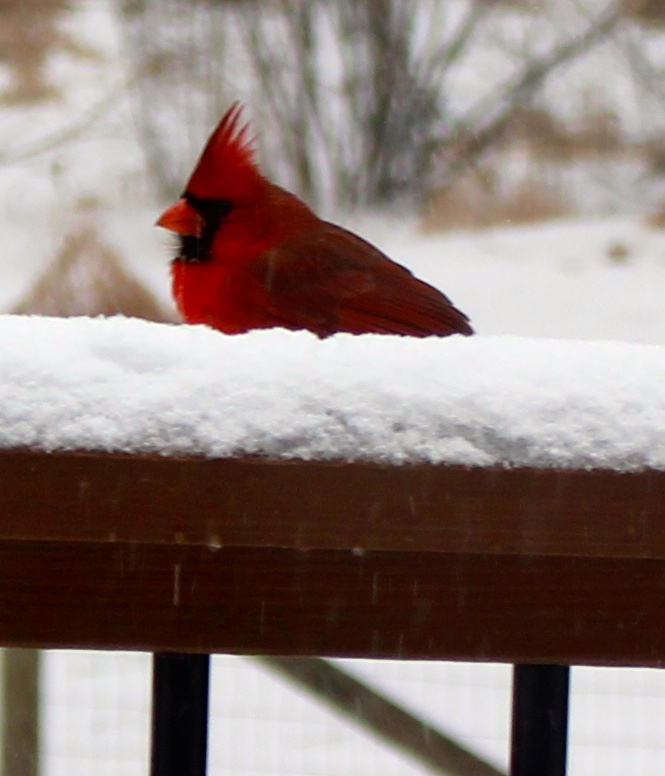 An unhappy cardinal surveys the sleet/snow accumulation on the deck railing as snow continues to fall. The forecasters predicted my area could receive as much as 6-8 inches of dry snow on January 7, but warm air pushed up from the south, so we ended up with 2.5 inches of sleet and 0.5 inch of snow on top. Normally, this would have disappeared in a day or two, but this time the frozen precipitation was accompanied by record cold. With ice covering the ground at my house, our thermometer registered 3.5 degrees Fahrenheit one morning, and 7 degrees the next morning. Nighttime lows “warmed’ into the teens after that. 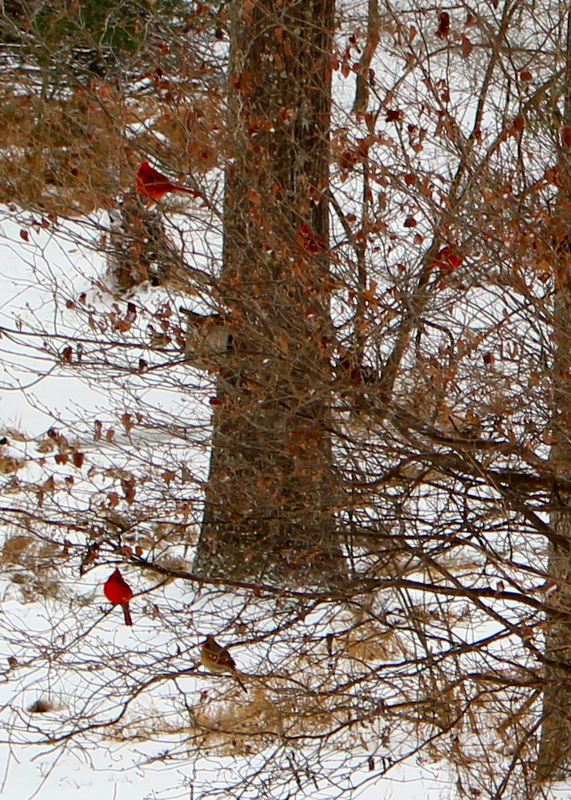 After the snow stopped, hungry birds bided their time on nearby bushes, waiting for their turns at the feeders. Snow plows concentrated on highways; my small road didn’t get plowed until January 10, and again several times on January 11. Wonder Spouse and I stayed home, enjoying the slowed pace of snow days, and entertained by the crazy drivers navigating our hilly road covered by a sheet of ice that had even 4-wheel-drive vehicles sliding precariously. 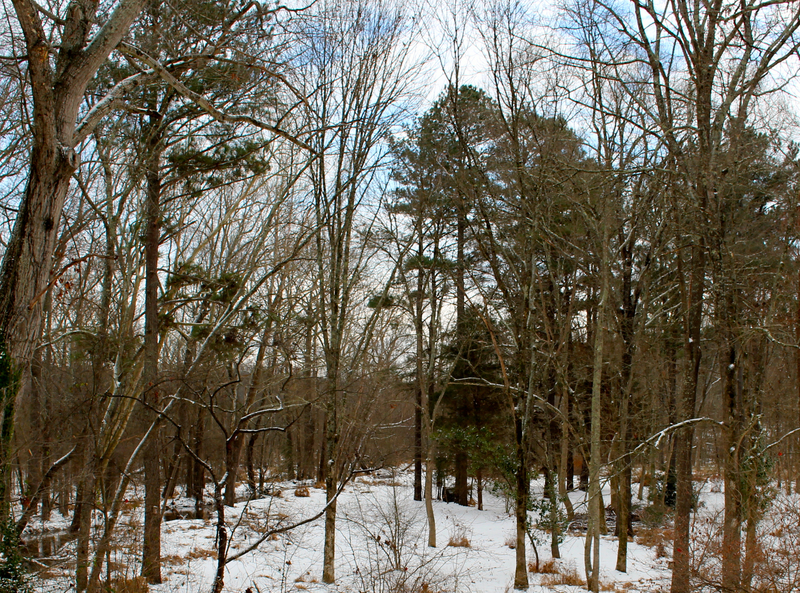 By late afternoon on January 7, the snow was plaguing Virginia and clouds opened to glimpses of blue skies. Wonder Spouse conducted business as usual via conference calls and computer links. I spent most of my time alternating between reading and wandering around the yard taking photographs. Hence, the rest of this post is mostly photos of a snowy landscape that melted in two days when 60-degree temperatures arrived on January 11. January 8th dawned at 3.5 degrees, and the thermometer never rose above 26 degrees. I stayed indoors; this southerner is not adapted for such temperatures. It “warmed” to the low 30s on January 9, and the mid-30s on January 10, so I ventured out several times for photos. I had not seen deer during daylight hours in my yard for several months — until the snow fell. A herd of five braved broad daylight to forage beneath the feeders several times each day. Foraging with the feathered ones. I enjoyed attempting to parse the tales told by myriad tracks left in the snow. I’ve no idea how one discerns between tiny bird feet. Deer prints were numerous, complete with skid marks on the hills when they punched into the solid layer of sleet lurking just below the veneer of snow on top. I’m guessing that these tracks were made at two separate times. I’d love to know what this critter (raccoon?) was doing to create this array. More than one of them? A major deer highway was also used by other species. Coyote? Bobcat? I’m not quite sure what predator this was that walked single-file, following the edge of the creek until it reached the bridge, where I lost sight of its tracks. Note the deer skid marks. This hill has done me in more than once when it is icy. A snow-covered mound of mulch was adorned by numerous bird-made hieroglyphs. The growing beaver pond and wetland on the other side of our creek was bedazzled by ice during the arctic blast. Note the snow-covered beaver lodge in the distance. Faster-moving sections of the creek only had ice along the edges. Slower-moving sections were frozen all the way across; changes in ice patterns likely reflect changes in water depth. Lacy swirls of ice adorned creek banks and pond edges. We were treated to a spectacular sunrise the next day. Warm sky colors belied the frigid air temperature. I walked out to survey the road at the end of our driveway. Ice skates were the only realistic option. Some folks refuse to allow Nature to dictate their behavior, but why resist what you are part of? Especially when we are part of something so beautiful. A favorite spot for salamander egg deposits — but not at this moment, I think. 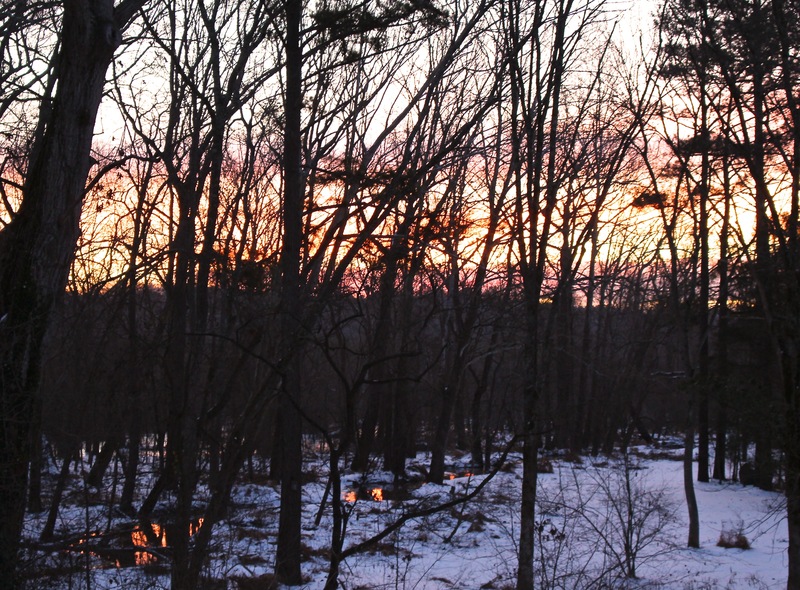 Sunset on January 10 was so vivid that even my southeast-facing view of our floodplain was highlighted by a pink evening sky, which appeared just as a nearly full moon climbed through the trees. That’s a blurry moon on the left side of this shot with pink sunset reflections in the southeastern sky. I think the snow cover somehow managed to bounce western sunset colors into the sky above my floodplain on the southeastern side of my yard. As the sky darkened, the moon rose to dominance. The ice-covered landscape was illuminated nearly to daylight levels. Finally on January 11, warm southern air surged in, and the great melting began, as you can see by the slumping ice on the solar panels on our roof. 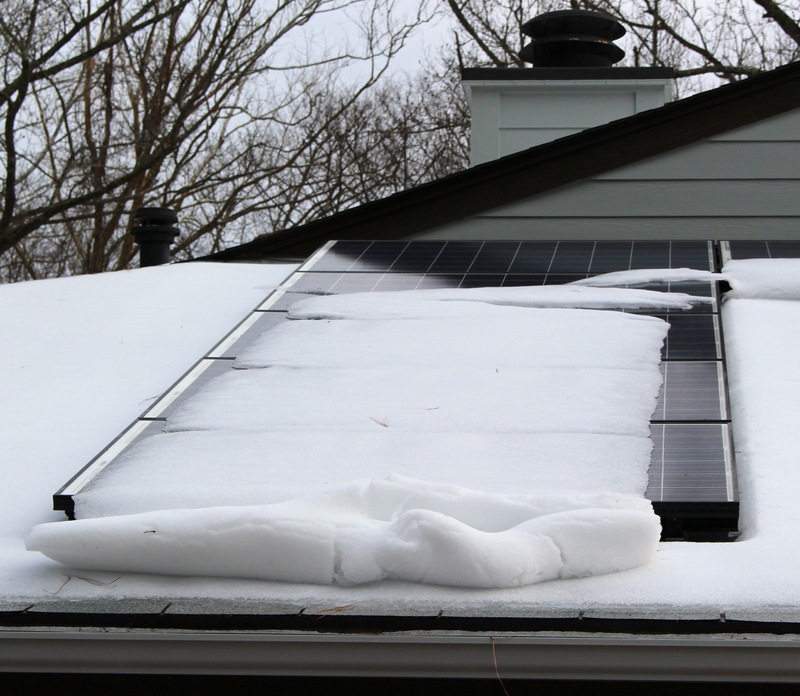 Despite bright sun, our panels were unable to generate any power until the ice finally slid off them. My final shot is blurry, but I could not resist the power of that almost-full moon, as it admired its reflection in the melting creek waters. Warm blessings to all those currently winter-bound. This entry was posted on January 16, 2017, 4:46 pm and is filed under Native Wildlife, piedmont gardening. You can follow any responses to this entry through RSS 2.0. You can skip to the end and leave a response. Pinging is currently not allowed. Your photos are wonderful. Living around the corner from you, I knew exactly what you were experiencing. Walking several times a day to check on the chickens, I too tried to figure out what animal made the tracks in the snow.